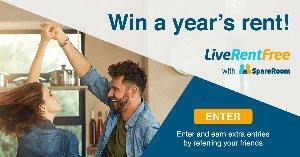 Prize: Grand Prize: 1 years worth of rent (up to $12,000). Monthly prize: $1,000 for rent. Statistics: This contest was opened by 41 and entered by 1 ContestChest.com members. 2% of those who opened the contest, entered it.